In my previous post I talked about the shift to mobile communication and the need for churches to pay attention—and act—on that shift. I suspect many of you reacted with a phrase heard in middle school hallways and mall food courts: WhatEVER, dude. Keep in mind that there’s a big difference between a mobile app and a mobile-friendly website. Apps can be cost-prohibitive, and even if you have the financial resources to develop one, they can be time-intensive as well. Apps themselves require time and attention; in other words, updating a mobile app creates yet another to-do item on your list. Who wants that? In comparison, mobile versions of websites automatically update when you update the regular web version. Apps are great because they come with a handy-dandy icon for one-click (or one-press) access to content. But did you know you can just as easily create an icon on your mobile device that links to a webpage? (In Safari on the iPhone, for example, select the “share” button at the bottom and then “add to home screen.”) Also, it’s important to note that mobile websites are indexed on search engines, but apps aren’t. But…can’t people already see our website on their mobile device—even if’s not specifically a “mobile-friendly website”? Yes, of course. And chances are it looks terrible and is difficult to navigate. Think about mobile apps and mobile-friendly websites you’ve seen; they have big buttons (thumb-friendly) and streamlined menus. According to a Compuware survey, 46% of mobile web users are unlikely to return to a website they had trouble accessing from their phone and 57% are unlikely to recommend the site. When it comes to mobile technology, function is critical. Wait a second. I just thought of something. We just implemented online giving on our website. So, if we have a mobile-friendly website, does that mean people could participate in the offering…from their phone?! Yes. 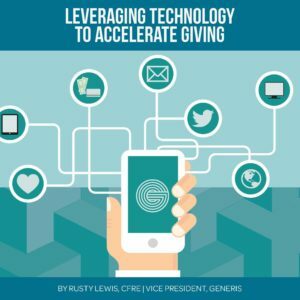 Going mobile is another way you can eliminate obstacles to generosity. Okay, okay, okay. I get it. But HOW do we go mobile? If you have a website, it can be optimized for the mobile web. In fact, Google has a great resource to help you. If you don’t have a website yet or if you’re in the process of redesigning your current site, there are many companies anxious to help you develop a website with built-in mobile capabilities (e.g. Clover and Bridge Element).